Was our universe created by a four-dimensional black hole? Based on what we know of our universe, many cosmologists believe it all began when the Big Bang spat a bunch of matter into being. But a lot of questions remain. That's why a Canadian astrophysicist has suggested that there's another possibility. Maybe our universe began with a 4D black hole? The standard Big Bang model tells us that the Universe exploded out of an infinitely dense point, or singularity. But nobody knows what would have triggered this outburst: the known laws of physics cannot tell us what happened at that moment. . . .
Afshordi and his colleagues [suggest that] our three-dimensional (3D) Universe is a membrane, or brane, that floats through a ‘bulk universe’ that has four spatial dimensions. Afshordi and his colleagues published their theory in a paper on ArXiv last week, suggesting that it could help explain the uniform temperature of the universe (which is still a mystery). It could also provide a reason for the Big Bang in the first place. 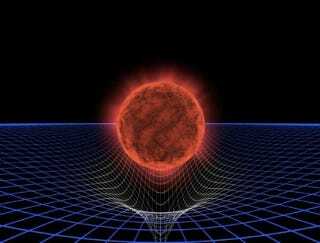 What triggered that hypothetical singularity to become a massive, ever-expanding explosion? “For all physicists know, dragons could have come flying out of the singularity,” Afshordi told Nature. At least his theory has the virture of explaining that initial explosion, and the aftermath — even if it doesn't have dragons.